Delaware Hayes freshman Chloe Jeffers (12) looks to pass while being defended by Centennial’s Naa Dromo Korley (00) in the Pacers’ 70-41 win over the host Stars Saturday night in Columbus. 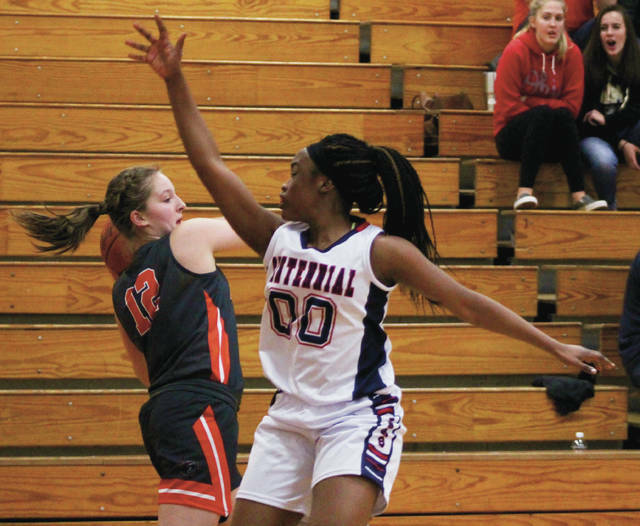 COLUMBUS – Sophomore Alexis Amabile has shown a propensity for scoring in bunches as a freshman … and that was on display again Saturday night at Centennial. She knocked down two of her four three-pointers in the first quarter to help the Delaware Hayes girls basketball team open with a 20-5 run. She finished with a game-high 23 points to lead the team to a 70-41 win over the host Stars. A Karli Theis basket followed by Amabile’s first three gave Hayes a 5-0 lead in the first minute and the Pacers (1-0) never trailed. Sophomore Alyssa Griner and freshman Chloe Jeffers each chipped in 10 points and Theis and Jordan Lantz – both sophomores – added seven points apiece. Lantz led with nine rebounds and three blocks and Griner had five rebounds and four steals for the Pacers. Hayes coach Lou Tiberi said the balanced scoring effort should help Amabile score more points by taking fewer shots. The Pacers shot 50 percent from the floor and made six of 12 three-pointers in the win. Tiberi was happy with the team’s effort, but was cautiously optimistic for what it meant for the season as a whole. The Pacers opened up with a pair of non-league victories to start last season before dropping four of their next five games. All four losses were against OCC-Cardinal competition and the one win was out of league play. Amabile hit her second three and Griner followed with back-to-back baskets highlighting a 7-0 run late in the opening frame before Morgan Lawson’s basket ended the run for the Stars, who trailed 20-7 at the end of the first quarter. Amabile hit her third three early in the second quarter and scored seven points in the frame to help the Pacers build a 38-18 edge at the break. Piper Adkins sandwiched a couple of baskets around an assist in a 6-0 run after Centennial scored the first three points to open the second half. She finished with five points, six rebounds and five assists. Jeffers finished the frame with a pair of free throws and a three-pointer to give the Pacers a 54-28 lead through three. Amabile scored the first five points of a 7-0 run early in the fourth to give the Pacers their largest lead of the game at 63-30. Morgan Lawson scored 11 of her team-high 14 in the second half and Jayana Harley added 11 points to lead the Stars (0-1). Hayes travels to Grove City Tuesday night to take on host Central Crossing. The non-league game is scheduled to tip at 7:30 p.m.
Olivia Margolies scored eight of her game-high 18 points in the first quarter as Olentangy built a 19-9 lead and cruised to the Skeeter Classic championship Saturday night in Urbana. Dani Beidelman scored all six of her points in the opening frame to help Olentangy build its lead. Meg Spohn had 13 points, Bridget Stafford finished with nine and Kennedie Daup chipped in eight for Olentangy (2-0). Grace Forrest led Mechanicsburg (1-1) with 15 points and Elly Schipfer and Emma Violet added 10 apiece. Olentangy, which plays its first six games on the road, travels to River Valley in non-league play Tuesday night. Tip is scheduled for 7:30 p.m.
Ohio Northern’s Jenna Dirksen knocked down a pair of baskets in the final 37 seconds, including a buzzer-beater to hand Ohio Wesleyan a heart-breaking 66-64 loss Saturday afternoon in Ada. ONU’s Tori Wyss knocked down a pair of free throws with 6 seconds left in regulation to send the game into overtime. OWU led by as many as five in the final minute of regulation. Jaclyn Yankle knocked down a three-pointer with 26 seconds left for the Polar Bears (4-0). Molly Delaney gave the Bishops a 63-62 lead with a three-pointer with a little over 3 minutes left and buried a free throw to extend the lead to two in the final minute. Devin Hefner had 18 points and seven rebounds, Delaney added 15 points and Tia Karras chipped in 12 to lead the Bishops (2-2). Dirksen finished with a game-high 22 points, Abby Weeks had 12 points, Emily Mescher added 10 and Tori Wyss turned in a 17-rebound performance to lead ONU. OWU is back at it Tuesday night at Defiance in non-conference play. Tip is scheduled for 7 p.m.
Caleb Cox and Gavin Wildermouth scored 11 points in a 15-0 first-half run for host Capital and Ohio Wesleyan couldn’t recover in a 90-81 loss in the NCAC/OAC Challenge Sunday in Columbus. Jaret Gerber hit a three to get the Bishops as close as 10 with 5:10 left in the first half. But Capital responded with a 12-0 run and led 50-32 at the break. Gabe Johnson hit a three to cap a 12-2 run to get OWU within three and Dawsin Tillman knocked down another with just under 10 minutes remaining to pull the deficit to two. Then, Capital’s Austin Schrek scored eight points in a 12-0 run to put the game out of reach. He started the rally with an and-one and knocked down a three later. Cox had a game-high 25 points and added nine rebounds, Will Hannah added 17 points and 10 rebounds, Joey Weingartner also had 17 points, Wildermouth chipped in 13 points and Schreck finished with 10 points to lead the Crusaders (2-2). Ethan Stanislawski had 16 points and five assists, Grant Gossard went for 15 points and seven rebounds, Gabe Johnson added 13 points and seven rebounds and Triston Tillman chipped in 12 points for the Bishops (2-2). OWU returns home Wednesday night against Hanover in non-conference play scheduled for 7 p.m.